I am a believer in the idea that wealth can stunt personal creativity. When you can buy it all, what’s the need to invent anything? When I was a kid my mother forbade me from playing with makeup. But I wanted to so badly that I chopped up the insides of my color pencils to a fine dust and turned them into eyeshadow and blush. Of course those wild invention days are over now that I am entitled to buy my own cosmetics, but I’m still, and will always be, a fan of DIY. One of the greatest parts about traveling is being inspired and finding new ideas and fixes for everyday life. 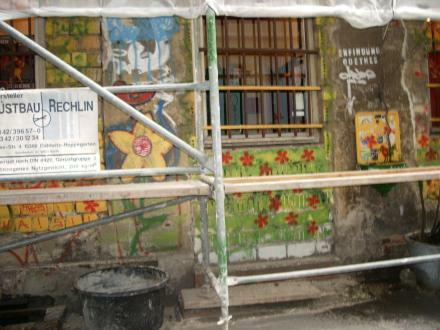 And in Berlin, I couldn’t help feeling thrilled at the creativity that percolated from the mix of youth, artists and students living in a fashionable and historic city. Combine these minds with shoestring budgets, and you get some of the most vibrant DIY ideas all around the city. Of course, many of these can’t be replicated exactly, but they do get the brain juices flowing. I saw one like this hanging in my host's kitchen. This is a great way to recycle and indulge your arts-and-crafts urges. I’ve actually seen these around in the U.S. but maybe I didn’t notice them as much in the local Urban Outfitters, where novelty trumps practicality. It’s a little too kitsch for me to tote around as an everyday purse, but can be great for the beach or to carry groceries. Learn how to make one of your own here (sewing machine needed). 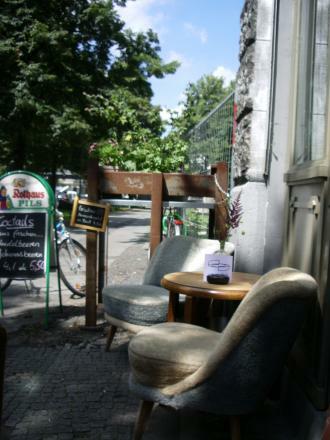 Much of the charm of Berlin comes from the mismatched furniture you see in the various bars and cafes. 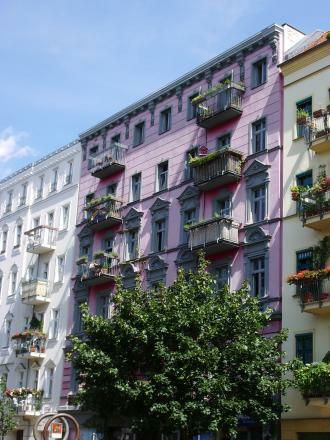 According to my Berliner host, much of the East is inhabited by students and those who have little money. So instead of shooting over to the local IKEA, the locals have actually picked up bits and pieces from flea markets and, if necessary, revamped them. .
Like these tweed chairs here. Some of it is just graffiti, but interesting nonetheless. I wouldn’t have thought of many of these color combinations on my own. I'm not sure I would paint my own house the same way, but it shows how paint can add life to otherwise ordinary walls. I was surprised how a little mint in my tap water could make me so happy on a hot, summer day. I’m not a big fan of lemon, so this was a nice, different touch. 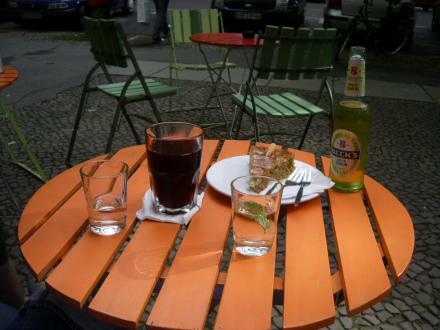 Surrounded by some good carrot cake and green lime beer -- and more examples of spruced up furniture. A pile of shipping crates or a funky door? 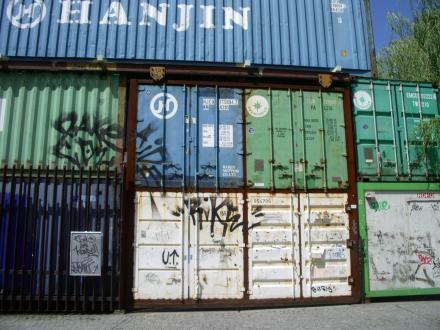 It was funny to see “Hanjin”, a label I’ve seen many times rolling on trains and trucks, as part of an entrance to a concert venue/bar. After all this, I was motivated to do some of my own DIY. I decided to make my own postcards out of the cool fliers I found in the bars and cafes around town. Sorry, I ran out of batteries before I could snap pics of them, but I can say they were much more interesting than the touristy European church postcards at your local souvenir store. Just glue some writing paper on the back and post and send as normal! It's so cool you posted about the shipping containers being re-used. I've seen some fun things with those done over the years. Berlin is a blast, isn't it? I've only been outside the US a few times, but each time, I was in areas where the local color really came through. It sure beat Stepford. 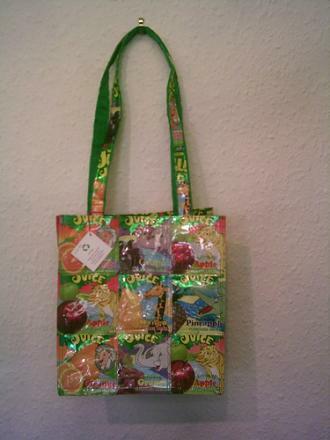 Regarding the Capri Sun bag: i would ALMOST always encourage DIY, but I wanted to share that purses, totes, and even sandals are being sold by thehungersite.com and the other agencies on those pages (breast cancer, literacy, child health, rain forest and animal rescue) - just click on a Store and in the Search, type "juice" - if you're interested, that is. What i really like about european countries is their gothic sensibility. i mean...take a look at their architectural designs. I used to work for The Hunger Site at its affiliated sites. They do a lot of good work, and try to buy from artisan projects and support a lot of great initiatives. That said, sometimes a lot of their stuff is just crap made in sweatshops in China. Make sure to check the origin (should be listed with the product description) before buying. And no matter what, DIY is more fun and satisfying than buying it online.